Founded in 2011 as a collaborative effort by law librarian groups from around the world, OFG had an impressive run before going on hiatus. Now, in 2015, the Private Law Libraries Special Interest Section of the American Association of Law Libraries has stepped up to breathe new life into this important forum. If you have a success story to share or some industry insights you are dying to impart, this is the place to do it! iBraryGuy’s John DiGilio (Reed Smith) returns to his role as the blog admin and is joined by editors, Andrea K. Guldalian (Duane Morris), Steven Lastres (Debevoise & Plimpton), and Julie M. Jones (Jones Day). 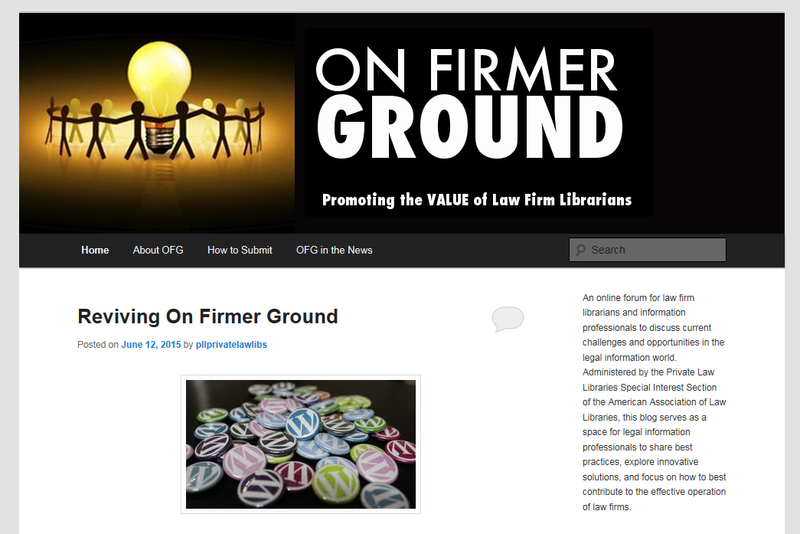 So let the conversations on the importance of law firm librarians re-commence! To read along and have your say, visit http://onfirmerground.com.